Description of "Yoga: Its Practice & Philosophy According to the Upanishads- Part 1"
This unique book in English explains in great detail the ancient technique of Yoga based entirely on the philosophy and teaching of the Upanishads. All aspects of Yoga have been elaborately dealt with in this book, and all its terms with their subtle meaning have been explained. 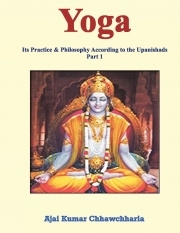 The uniqueness of this Book lies in the strength of the Upanishads that deal with Yoga from two perspectives—its philosophical angle and spiritual angle, and its health promoting exercises. All such Upanishads have been fully translated and explained in English, and included in the book in their entirety. As is well established, Yoga not only leads to a healthy physical lifestyle but takes its practitioner on the path that provides him or her with a comprehensive formula that helps in total evolvement in all matters that concerns his or her well-being, both in physical terms as well as in spiritual terms. Reviews of "Yoga: Its Practice & Philosophy According to the Upanishads- Part 1"